Snow Place Like Home is the name of the fourth chapter of King's Quest, published by the new Sierra. It’s hard to tell when this chapter is set since while it borrows several plot elements from the original King’s Quest timeline, it also changes several of them too. The first part of this chapter seems to be set shortly after the events in King’s Quest – Chapter 3: Once Upon a Climb, which was a re-telling of the original King’s Quest II. However, the bulk of the chapter recounts events that would’ve occurred just after King’s Quest III in that we have an older King Graham exploring his relationship with a teenage Prince Alexander/Gwydion who is effectively a stranger to him. Just like the previous chapters, the music in King’s Quest is top notch, borrowing themes used in previous games. I was especially chuffed to hear a variation to King’s Quest V’s Town theme :). Most of the voice actors will be familiar to those who have played the previous chapters although there are a a couple of new voices too: Vito Scaletta.. er I mean... Rick Pasqualone voices the older Prince Alexander and Alexander Polinksy voices the teenage Alexander (Rosella is voiced by Cherami Leigh and Kari Wahlgren who voiced parts in previous chapters too). Just like previous chapters, there are quite a few references to the original King’s Quest games. Obviously most of the references in this game (at least ones relating to Prince Alexander) are derived from King’s Quest III, although I did notice a few nods to my favourite King’s Quest: King’s Quest V.
It wouldn’t be a Sierra adventure game without puns and there are quite a lot of them in this chapter. This chapter is basically dedicated to exploring the relationship between King Graham and his prodigal son, Prince Alexander. King Graham’s struggles in trying to find common ground with his son and accepting him as an adult are sometimes hilarious, sometimes awkward, yet always convincing. For those that complained about the chapters becoming shorter in terms of time required to complete them, you’ll be glad to know that this is the longest chapter I’ve played since the first one. True, most of the time is spent solving puzzles instead of conversing with other characters but there's no denying that it's a longer chapter. My favourite King’s Quest villain revealed at the end! And I’m not going to say any more than that, you SWINE! This chapter’s strength is also its weakness: with so much time spent solving puzzles, there’s actually not much time left for interacting with anything else or exploring anywhere. You’ll probably finish the chapter feeling there could’ve been better characterisation or plot development. The chapters are becoming progressively linear and that’s definitely the case with this one where you basically enter a room, solve the puzzle, unlock the exit, move on to the next room, repeat: there are very little opportunities to explore the world. Even Prince Alexander jokes about this in-game. There is one point in the game when a character I did not expect to have a particular ability suddenly does and it occurs at a very convenient time too. Since I haven’t played every King’s Quest maybe I’m missing out on some reference but I very much doubt it. There’s also no hint or explanation how the character came across the ability in the first place (sorry for being so cryptic but I didn’t want to give too much away). Maybe I’m biased (being the father of two girls) but I felt that Rosella is somewhat neglected in this chapter and despite King Graham’s attempts at reassuring the audience that he loves his daughter too, it’s not quite the same as his fixation on his son, Alexander. Yes, in terms of the plot it does make some sense (King Graham hasn’t seen his son for a very long time after all) but it also feels like King Graham values affection from his son more than his daughter. Or maybe I’m being too sensitive about this and perhaps this is all intentional: maybe a rocky relationship between Graham’s children will be explored in the final chapter? 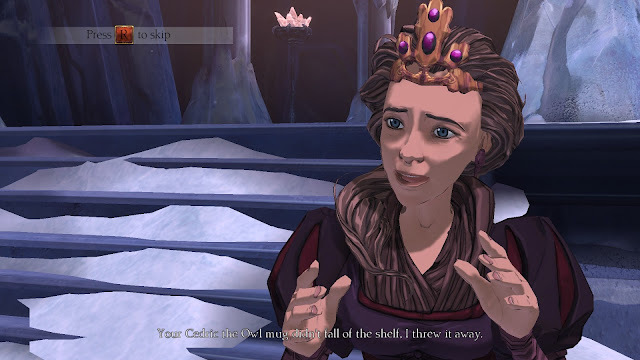 Snow Place Like Home touches on events that occurred in the original King’s Quest series yet again like previous chapters, revises them. In this chapter, you’ll learn more about Graham’s relationship with his teenage kids and how the kids relate to the rest of the family as adults. The chapter also contains a lot of rooms with puzzles and riddles, although it can feel somewhat claustrophobic and linear considering you spend the majority of the game progressing from one level to the next, a bit like Portal. Overall, I had fun with this chapter and once again enjoyed the high production values, references to the original series and puns! Is the game worth $9.99 USD? : Yes. While this chapter is still not as long as the first chapter it is longer than the other two chapters and as an added bonus it features lots of puzzles, which adventure gamers love, right?